Not many people know a great deal about the bench players for Oregon Men’s Basketball. Many teams often see unfamiliar faces during blowouts or when coaches change strategy, for that matter. It’s important to realize that these guys, who can sometimes seem out of place on the court, are actually pretty darn good basketball players. As a role player coming off the bench, it’s a tough situation. You’re expected to play well even though you haven’t played many crucial minutes the entire season, yet nobody expects too much of you. 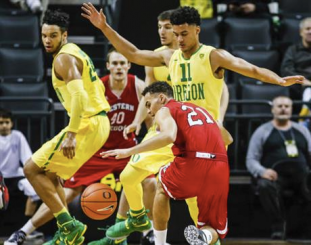 For freshman Keith Smith, defense has been his calling when Altman yells his number. Though Smith’s minutes were cut down drastically due to his knee injuries this year, missing all of February, he hasn’t let that keep him from trying to make the most of his court time. In his first season he’s averaging six and a half minutes, two points and a rebound in 27 games. His best game far and away was against Savannah State on December 3rd, when he went off for 15 points, 8 rebounds and 6 assists! Unfortunately, Smith is a little too familiar with knee injuries. During his sophomore year, Smith tore his ACL and played only 10 games as a junior, then 13 his senior year. However, he was productive with the minutes he had, averaging 18.5 points as a junior and 15.7 his senior year. It’s actually remarkable that Smith was as highly recruited as he was considering the number of games he played. One can look at his limited experience as a positive or negative. On the one hand, his limited playing time in high school could make him unprepared for playing at the collegiate level. That being said, we haven’t really seen him rise to his potential level yet, because he is very young. If you want to see what made him so popular to teams, check out some of his highlights in this video. In high school, Smith blossomed early. While just a sophomore, he averaged more than 20 points per game, including three 30-point games. He originally played for Franklin High School before transferring to Rainier Beach for his junior season. There, under the watchful eye of head coach Mike Bethea, Smith and the Vikings won a third straight 3A State Championship his senior year. Smith’s contribution starts with his defensive presence. Fans got to see Smith on the national stage during this year’s NCAA tournament, particularly during the Round of 32 matchup against 11-seed Rhode Island. Altman had told Smith in practice beforehand to “be ready whenever they called for me in we needed a boost.” Indeed, that’s what Smith gave them. He totaled four minutes and helped trim Rhode Island’s lead in the second half. Playing in tournaments and for championships are what drew Smith to Oregon, according to Duck Territory. 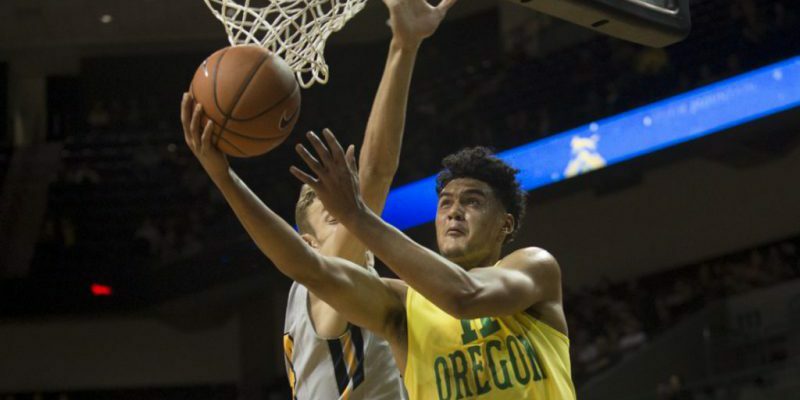 “He got us going in the press, and he hit two big free throws,” Altman said, via The Register-Guard. ”I thought he did a good job for us and gave us good minutes.” Those free throws he hit in the beginning of second half relate to what I said earlier. It’s incredibly difficult to come into a game, heck, especially during the NCAA tournament and hit shots that you haven’t been consistently taking all season. The last time he even attempted an in-game free throw was on January 14th, in a blowout victory versus Oregon State. As time goes on, it’s likely that Smith will get more playing time as a new roster develops for the Ducks and as he becomes more skilled at the collegiate level. Special thanks to Duck Territory at 247sports.com for sharing this information with FishDuck.com; check out their trial subscriptions for the best up-to-date information on Oregon recruiting.